This week we sit down with Kevin Morlock, Steve Martinez and Austin Adduci of Indigo Guide Service. 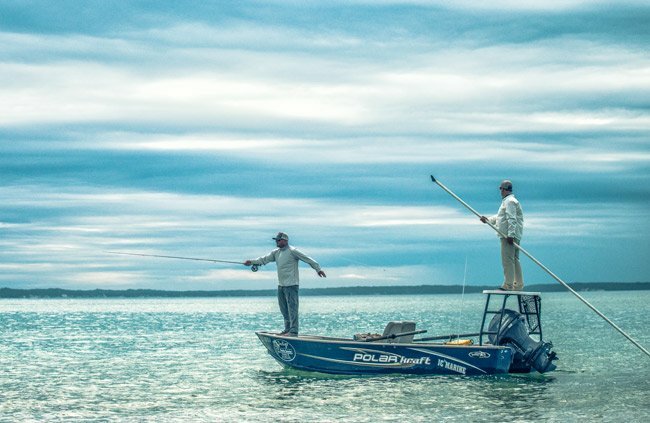 With some 30 years combined experience on Lake Michigan’s Beaver Island archipelago—arguably the best carp fishing in North America—these guys know their flies, their fish and their water. 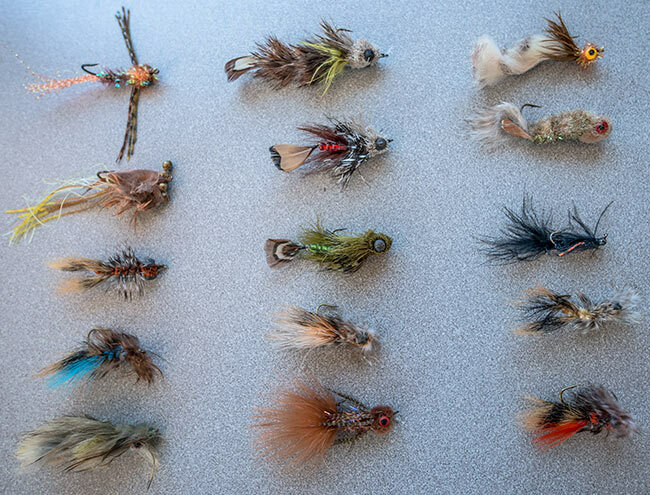 We started the conversation with a simple question: what’s in your fly box? Kevin: My goby box is probably my favorite fly box; I’ve been using this one for a long time. When gobies showed up here ten years ago I didn’t even know what they were at first; they were these little half inch things skittering along the bottom. I had heard about gobies from Lake Erie, but it took ten years for them to make it this far north. By the next season those half inchers were about two inches long. I caught some, studied them and started tying imitations. The carp like to eat them, so we’ve got a lot of goby imitations. MC: It looks like all of these patterns are articulated. Kevin: Yes, some are even triple articulated. Why I punish myself that way, I don’t know. MC: How and when are you fishing these? Kevin: How you fish any fly to any carp is going to be dictated by their mood throughout the day. Sometimes the cruisers are going to want that fly ripped across their face, sometimes they’re more passive where you’re just going to need to bounce and dip the fly a little along the bottom to get their attention. 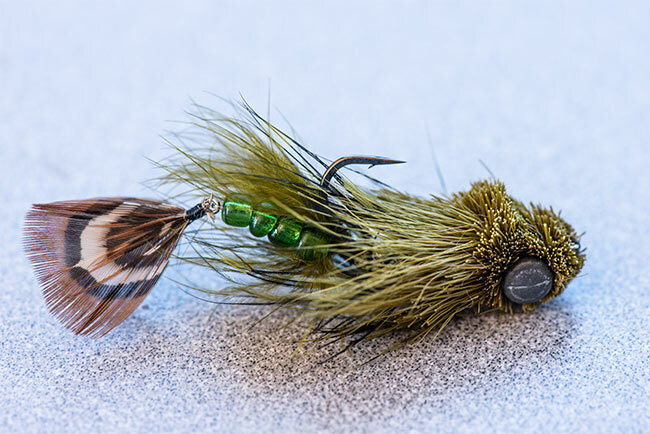 For the tailers, you’re going to have to put the fly right on their dinner plate. And I mean that literally. They are tipped down and feeding, and you can imagine that they’re eating off a plate and you need to put that fly on there. Those tailing fish see the shadow of the fly, not necessarily the fly itself, on its way down through the column. So it’s important to have that shadow right there for them to see. And if you do that then it’s almost always a home run, especially if it’s a light colored fish. They have much better eyesight than the darker fish. Steve: We’re not sure of why they are different, but they are. The dark ones don’t look anything like the light ones. The light ones are more muscular, they’re longer, they’re sleeker, they fight better. The black ones actually have a softer feel when you hold them. They’re squishier. The scales are more sand papery and they have the big bulging eyes like those goofy things they sell in pet stores. And it’s obvious that they don’t see as well the others because they swim under the boat, they swim between your legs. You can tell they’re not observant as the lighter colored fish. A light gold fish will spook from much further out. The distinction between light and dark fish is important because some areas have more of those dark colored carp than other areas, and we try not to spend too much time there unless we have to. The areas that you always put more fish in the boat seem to be the areas with more of those lighter color. Yesterday we weren’t seeing a lot of fish so we spent more time than usual on a dark fish. We put the fly in front of it twice yesterday, right on the dinner plate, and then we just moved on. If it would have been a bright fish, we would have kept working it, but being a dark fish we gave up. MC: How have the particulars of this fishery affected your fly design? Kevin: When you’re sight fishing in water as clear as we have, you get that positive, immediate feedback. It didn’t like it. It was interested, but it wouldn’t eat it. Or it pounced right on it. With that sight fishing, you get the immediate feedback, which helps you experiment and learn why they are or aren’t responding to a particular offering. We also benefit from having such a dynamic fishery. There’s 380 miles of shoreline and carp are everywhere. Fishermen get them in their nets at 100 feet; we see them in the weeds with their backs out of the water. They occupy every nitch of this archipelago, and we target them in a variety of different areas and at a variety of depths. MC: How have your patterns changed over the years? Kevin: When I first started carping maybe fifteen years ago, in the Great Lakes, we were fishing little bitty flies. A big fly was two inches long: little crayfish and hex nymph patterns. And we did fine. Then five or six years ago something changed. I fished all day with my small flies and only caught one fish. As soon as I tied on a bigger fly, bam, they were hitting. The only change there was that the gobies had gotten larger. These thing move in cycles. We’re starting to see a slow decline in the size of the gobies, so over the next several years our fly sizes are going to reflect that. MC: Let’s talk color. I’m seeing a lot of natural, undyed feathers in these patterns, but I’m also seeing a few bright, unorthodox colors. Kevin: One neat thing we’ve learned about tying carp flies is that any natural material is good. I’ve never seen you able to go wrong with natural deer hair, natural squirrel, natural pheasant hackle. All of that is always absolutely consistent. If it’s dyed materials and synthetics, however, you’ve introduced some unpredictability into the equation. We’ve learned that that sometimes it’s less the color than the material or the tonality. For instance, we can’t say for certain that they like pink, because they may like certain pink dubbings but not others, even though they look identical to the human eye. Take Senyo’s Laser Dub, for instance: they love that pink. But other pink dubbings they won’t touch. So we trend toward natural, undyed colors and materials for the most part, though we do occasionally throw brighter stuff on those days where it’s more difficult to get their attention. That said, it’s a fine line between getting their attention and spooking them. Sometimes you can get their attention from a greater distance with a bright fly, but then they’ll swim over and won’t eat it. A more natural color they might be more likely to eat, but some days they just can’t see it; you’ve got to put it right in front of the fish to get their attention with it. Even then, sometimes it’s like the fly doesn’t exist. That’s the occasion for brighter colors. Of course, there are also the days when they are seeing and eating everything. When they’re hot, they’re hot. I take that back, they won’t eat everything. The one fly component you can’t toy with too much is tinsel. They have a low tolerance for anything gold or silver that’s too bright or too flashy. They’ll see that and then shy away from that almost all of the time. That said, a few of our patterns are tied with flashier hotspots only visible when you’re below the fly, just the tiniest bit of flash or accent color. The fly might give a spark on the way down, but by the time it settles and a carp has to decide whether or not to eat it, the tinsel is gone, invisible. MC: So gobies are a primary forge for the carp. What about crayfish and other foodstuffs? Austin: Crayfish are my favorite family of fly. There are a lot of crayfish out there on the flats. I tie my crayfish to fish in a few different parts of the water column. The ones that fish down deep are skimpily tied. MC: And some of them have a fair amount of rabbit strip. They almost look like smallmouth flies. Austin: I throw those bigger rabbit ones when the fish are in the surf. The rabbit-heavy crayfish seem to swim well in the waves, all that passive movement in the materials. MC: Do you fish them the same way you would a gobie? Austin: You can fish a crayfish a bit quicker than a goby. Gobies don’t have air bladders. They don’t come off the bottom more than six inches, so gobies are at bottom depth, where you could swim a crayfish a little bit quicker and a little higher in the column. So a crayfish has the ability to come up more than a goby. It just becomes an advantage when it’s getting into that line of vision. MC: Do you ever have fish eat on the drop or do they typically wait for that fly to settle on the bottom? Kevin: They typically wait until the drop stops. It’s a pretty odd-ball thing to get one to eat mid-water. That said, I’d say there’s a couple of situations where it is not beneficial to be on the bottom, and we’ll actually tie a lighter fly on with a straight knot instead of a loop knot so it sinks slower. One is when you’re in algae that’s covering the bottom, or you’re in weeds. Yesterday we had a fish that twice tried to eat the fly but the fly kept going down in this little patch of grass. The fly would sink past him, he’d move to eat it, it would sink into the grass out of reach. Then you’d hop it back out and he’d jump after it, and then it would settle in the weeds again. But that is so rare. MC: Do you guys have a set routine for how you cycle through flies to find something that works? Steve: I can’t speak for everybody. I have a specific routine that I always follow. I always fish my goby patterns first, so I always stick with a goby pattern. I swim mine wherever, if I see a fish coming in mid-water, I’ll try to get their attention. They’re opportunistic feeders by nature, so sometimes the things they do don’t really make any sense. If I can’t get bit on an area with goby, then I’ll switch to crayfish. If that doesn’t ever seem to work then I’ll size down a little bit, but me personally, I’m pretty specific in my colors. I lean on olives and natural browns. I don’t get too flashy very often. MC: What are your rod setups? Steve: I usually carry two rods. You’ve got a short rig and a deep rig. Austin: Me, too. I go one wing span which I’m assuming is six foot. Then I’ve got a long line for deeper water fishing. The long one is always tied with a loop knot since that loop creates a faster drop. A tied-straight fly is going to parachute down slowly, but a fly tied on a loop is going to go right straight down. Kevin: In a perfect world I would actually carry four rods. I’d have two with five foot leaders: one with a fast sinking fly and one with a slower sinker. Then a medium setup with an eight foot leader, and finally a really long one with a twelve foot leader. That would be really great. You’d be ready for just about anything.